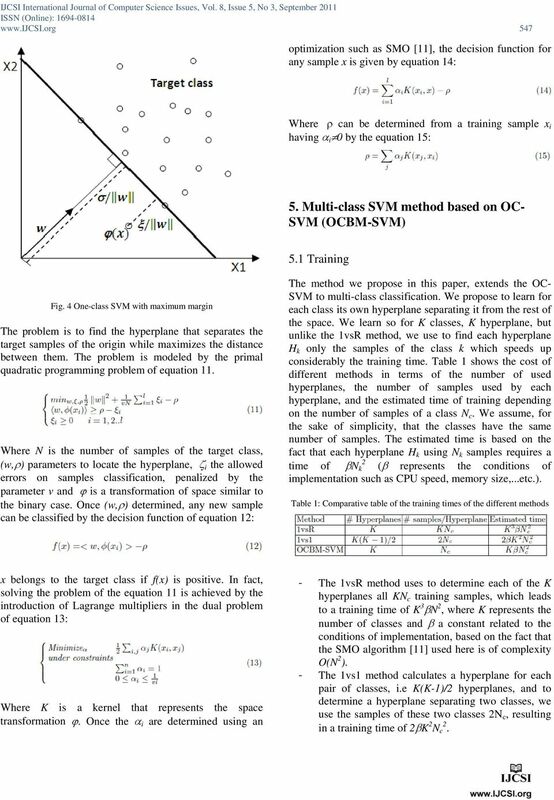 Download "A fast multi-class SVM learning method for huge databases"
4 547 optimization such as SMO , the decision function for any sample x is given by equation 14: Where can be determined from a training sample x i having i 0 by the equation 15: 5. 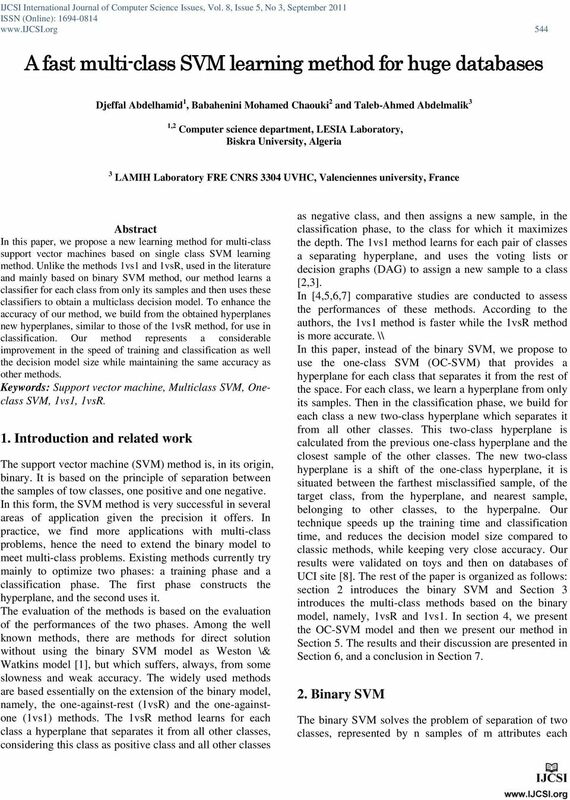 Multi-class SVM method based on OC- SVM (OCBM-SVM) 5.1 Training Fig. 4 One-class SVM with maximum margin The problem is to find the hyperplane that separates the target samples of the origin while maximizes the distance between them. The problem is modeled by the primal quadratic programming problem of equation 11. Where N is the number of samples of the target class, (w, ) parameters to locate the hyperplane, i the allowed errors on samples classification, penalized by the parameter v and is a transformation of space similar to the binary case. Once (w, ) determined, any new sample can be classified by the decision function of equation 12: The method we propose in this paper, extends the OC- SVM to multi-class classification. We propose to learn for each class its own hyperplane separating it from the rest of the space. We learn so for K classes, K hyperplane, but unlike the 1vsR method, we use to find each hyperplane H k only the samples of the class k which speeds up considerably the training time. Table 1 shows the cost of different methods in terms of the number of used hyperplanes, the number of samples used by each hyperplane, and the estimated time of training depending on the number of samples of a class N c. We assume, for the sake of simplicity, that the classes have the same number of samples. The estimated time is based on the fact that each hyperplane H k using N k samples requires a 2 time of N k ( represents the conditions of implementation such as CPU speed, memory size,...etc.). Table 1: Comparative table of the training times of the different methods x belongs to the target class if f(x) is positive. In fact, solving the problem of the equation 11 is achieved by the introduction of Lagrange multipliers in the dual problem of equation 13: Where K is a kernel that represents the space transformation. Once the i are determined using an - The 1vsR method uses to determine each of the K hyperplanes all KN c training samples, which leads to a training time of K 3 N 2, where K represents the number of classes and a constant related to the conditions of implementation, based on the fact that the SMO algorithm  used here is of complexity O(N 2 ). - The 1vs1 method calculates a hyperplane for each pair of classes, i.e K(K-1)/2 hyperplanes, and to determine a hyperplane separating two classes, we use the samples of these two classes 2N c, resulting in a training time of 2 K 2 N c 2. 5 Our method requires the calculation of K hyperplanes, each separates a class from the rest of space. To determine each hyperplane, we use only the samples of one class, resulting therefore in a total training time of about 2KN c 2. It is clear that: This means that the proposed method optimizes the training time compared to methods 1VsR and 1vs Classification OC-SVM method allows to find a hyperplane separating one class from the rest of space, this hyperplane allows to decide on membership of a new sample to this class. If the sample is above the hyperplane then it belongs to the class, but if it is below, we have no information on to what other class the sample belongs. To correct this situation, we propose to modify the obtained hyperplane to enhance the decision information in the case where the sample does not belong to the class. We propose to find for each hyperplane of a class, the closest sample among the samples of all other classes, then shift the hyperplane by a distance equal to half the distance between this sample and the misclassified sample, of the target class, that minimizes the decision function (the farthest one from the hyperplane) (cf. Figure 5). Fig. 5 Classification in OCBM-SVM method More formally, let H k (x) be the decision function using the hyperplane of the k th class. And let x - k be the misclassified sample of the class k farthest from the hyperplane H, and x - k the closest sample to the hyperplane H, belonging to a - class different to k. The distance of x k from the hyperplane is given by H k (x - k ) and the distance between the hyperplane and x k - is given by H k (x k - ). The proposed shift is [H k (x k - ) + H k (x k - )]/2, and the new decision function for a sample x can be calculated by the shifted hyperplane Hdk of the equation 17: After calculating all the K shifted hyperplanes, the decision about the class k * of a new sample x can be given by the discrete decision rule of equation 18: Table 2 shows a comparison between the time of classification of a new sample by different methods. This time is calculated based on the number of support vectors of each hyperplane, which is equal, to the maximum, the total number of samples used to find the hyperplane. Table 2: Comparative table of classification time of the different methods - The 1vsR method uses K hyperplanes, and to test a sample, it is evaluated for all hyperplanes. Knowing that each hyperplane contains a number of support vectors equal to the maximum total number of samples, the estimated time to find the class of a sample is K 2 N c, where is a constant that represents the conditions of implementation. 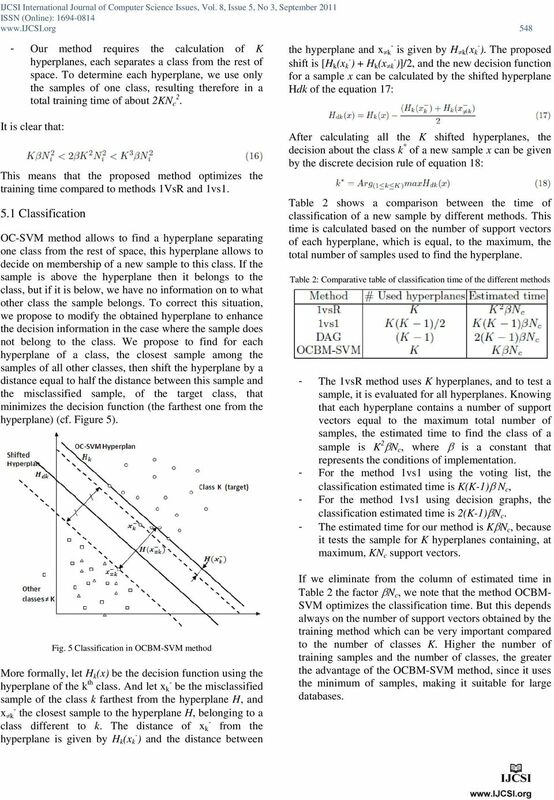 - For the method 1vs1 using the voting list, the classification estimated time is K(K-1) N c, - For the method 1vs1 using decision graphs, the classification estimated time is 2(K-1) N c. - The estimated time for our method is K N c, because it tests the sample for K hyperplanes containing, at maximum, KN c support vectors. If we eliminate from the column of estimated time in Table 2 the factor N c, we note that the method OCBM- SVM optimizes the classification time. But this depends always on the number of support vectors obtained by the training method which can be very important compared to the number of classes K. Higher the number of training samples and the number of classes, the greater the advantage of the OCBM-SVM method, since it uses the minimum of samples, making it suitable for large databases. 7 550 only 126,593 seconds while maintaining accuracy better than the method 1vs1. For the same database, the size of the model was also reduced from KB for the 1vs1 method and 2148,554 KB for 1vsR to 555,314 KB. Table 5: Results on different databases With all its advantages, our method preserves a recognition rate in the range of rates obtained by other methods and sometimes better (case of Abalone database). 7. Conclusion In this paper, we presented a new method for multiclass learning with support vector machine method. Unlike classic methods such as 1vs1 and 1vsR extending the principle of binary SVM, our method (denoted OCBM- SV) extends the principle of one-class SVM method. And to achieve the generalization ability of binary SVM, we changed the hyperplanes obtained by the oneclass method to take into account information of other classes. The obtained results show great improvement in training time and decision model size. Our method also allows improving the classification time (decision making) of new samples by reducing of the number of support vectors of the decision model. The obtained accuracy is very close to that of other methods and sometimes better. 8. References The proposed method keeps a classification time, in the case of large databases, close to that of the method DAG representing the fastest method in terms of classification time. Indeed, we note, in databases with a number of samples less than 1000 (case of PageBlocks, Segment and Vehicule) that the classification time obtained by some methods is better than ours. 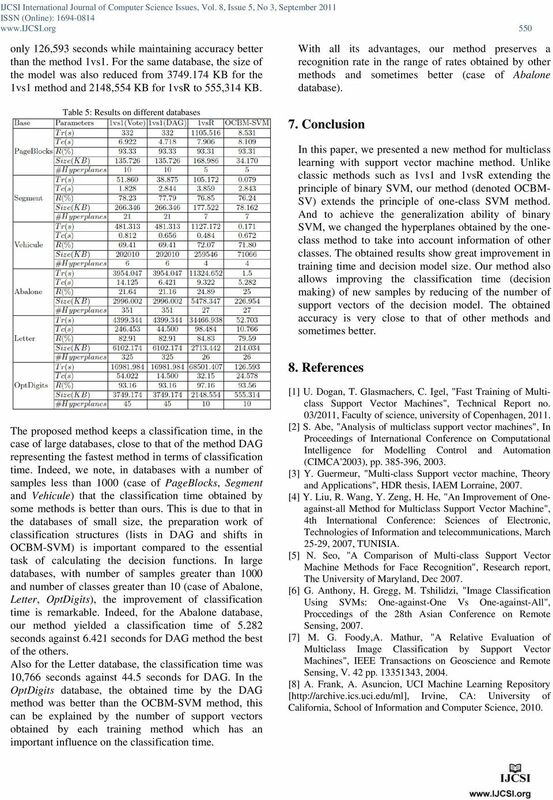 This is due to that in the databases of small size, the preparation work of classification structures (lists in DAG and shifts in OCBM-SVM) is important compared to the essential task of calculating the decision functions. In large databases, with number of samples greater than 1000 and number of classes greater than 10 (case of Abalone, Letter, OptDigits), the improvement of classification time is remarkable. Indeed, for the Abalone database, our method yielded a classification time of seconds against seconds for DAG method the best of the others. Also for the Letter database, the classification time was 10,766 seconds against 44.5 seconds for DAG. In the OptDigits database, the obtained time by the DAG method was better than the OCBM-SVM method, this can be explained by the number of support vectors obtained by each training method which has an important influence on the classification time. U. Dogan, T. Glasmachers, C. Igel, "Fast Training of Multiclass Support Vector Machines", Technical Report no. 03/2011, Faculty of science, university of Copenhagen,  S. Abe, "Analysis of multiclass support vector machines", In Proceedings of International Conference on Computational Intelligence for Modelling Control and Automation (CIMCA'2003), pp ,  Y. Guermeur, "Multi-class Support vector machine, Theory and Applications", HDR thesis, IAEM Lorraine,  Y. Liu, R. Wang, Y. Zeng, H. He, "An Improvement of Oneagainst-all Method for Multiclass Support Vector Machine", 4th International Conference: Sciences of Electronic, Technologies of Information and telecommunications, March 25-29, 2007, TUNISIA. N. Seo, "A Comparison of Multi-class Support Vector Machine Methods for Face Recognition", Research report, The University of Maryland, Dec  G. Anthony, H. Gregg, M. Tshilidzi, "Image Classification Using SVMs: One-against-One Vs One-against-All", Proccedings of the 28th Asian Conference on Remote Sensing,  M. G. Foody,A. Mathur, "A Relative Evaluation of Multiclass Image Classification by Support Vector Machines", IEEE Transactions on Geoscience and Remote Sensing, V. 42 pp ,  A. Frank, A. Asuncion, UCI Machine Learning Repository [ Irvine, CA: University of California, School of Information and Computer Science, 2010. Convex Optimization SVM s and Kernel Machines S.V.N. Vishy Vishwanathan vishy@axiom.anu.edu.au National ICT of Australia and Australian National University Thanks to Alex Smola and Stéphane Canu S.V.N.